WOONSOCKET, R.I. — CVS Health has unveiled a suite of digital tools designed to help customers better manage and adhere to their prescriptions. The company said Wednesday that the five new digital health tools — Apple Watch app integration, Scan Paper Script, Insurance Card Scan, MedRemind and in-store pharmacy messages — were developed to address specific issues facing customers. 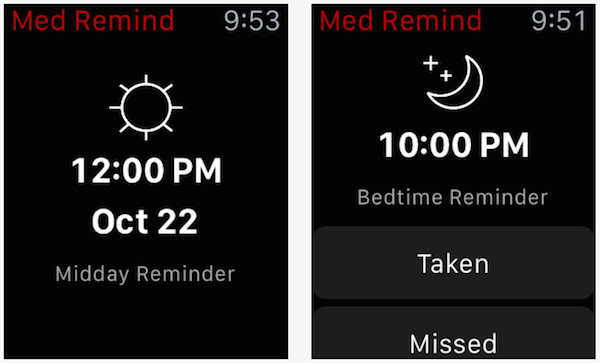 In the CVS/pharmacy iOS mobile app, the MedRemind function — shown here on the Apple Watch — helps customers stay on track with their medication schedules. Now Apple Watch-compatible, the CVS/pharmacy mobile app can notify customers when prescriptions are ready, facilitate prescription refills and enable users to check information at a glance. The app is also supported on mobile phones and tablets. Meanwhile, the Scan Paper Script tool enables customers to quickly start the prescription fill process by capturing a photo of their written prescription via the CVS/caremark mobile app. According to company research, an estimated one-third of prescriptions are never filled. The MedRemind function, now deployed in the CVS/pharmacy iPhone mobile app, helps customers stay on track with their medication schedules by allowing them to customize reminders to take their prescriptions at the right time and notifications to caregivers when a dose is missed. It also includes text reminders and the ability to receive reminders on the Apple Watch. Another tool aimed at helping customers stay on their meds is in-store pharmacy messaging. CVS Health said that customers using the mobile app from CVS/pharmacy, the retailer with the largest deployment of beacon technology, can opt to receive push notifications to be notified if their prescription is ready for refill or pickup when they enter the store. In addition, the Insurance Card Scan functionality allows customers to easily share new insurance information with their pharmacist by taking a photo of their insurance card, instantly updating data across CVS’ store systems. CVS noted that since the opening of the CVS Health Digital Innovation Lab in June, its digital technology team has been focused on developing cutting-edge digital services and personalized capabilities that enable people to manage their health wherever they are. Pharmacy customers enrolled in digital and online programs have better medication adherence and lower health care costs overall, according to research by the CVS Health Research Institute. “Our research shows that digital and online tools help make adherence easier and more accessible for our customers across the enterprise, and evidence suggests that better adherence improves patient health outcomes while reducing health care costs,” explained William Shrank, senior vice president and chief scientific officer at CVS Health. Preliminary findings from the CVS Health Research Institute show that patients enrolled online at CVS.com, Caremark.com or CVSspecialty.com are more likely to fill their prescriptions and adhere to their medications. Among CVS/caremark members with common chronic conditions such as hypertension, 10% more members improved their medication adherence to optimal levels after enrolling online at Caremark.com, compared with members who did not enroll. Also, CVS/caremark clients could save up to $2.3 million in medical cost avoidance annually per 100,000 registered users, according to CVS.